Very very good. 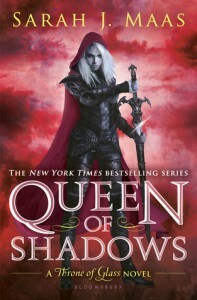 I enjoyed this new installment of the Throne of Glass series. I liked the POVs, the characters and the twists and turns of the plot, which were not entirely predictable. I appreciated the previous book too, but it had been frustrating because while it laid the foundations for the second part of the series, it lacked rhythm and the whole master/pupil scenario got boring after a while. This time there are finally some resolutions, the plot moves forward in a certain direction and, from the look of it, with many more books to come. They took one look at her weapons, at that utterly wicked suit of hers, and decided they liked having their organs inside their bodies. As far as the romance goes, there is some teenager-level tension, kind of funny considering the age of all the parties involved but anyway, Maas keeps a foot in both (several, actually) camps so there’s a lot of teasing, more couples in the making and nothing conclusive. I was a bit disappointed with the character of Chaol, maybe it was inevitable at this point, but he used to show more backbone in the past. Manon has really grown on me, she is not an easy character to handle and the latest developments of her story are very interesting. I’m looking forward to the next book!